The roof on your commercial property sits in a vulnerable position, so it’s particularly susceptible to aging and wear. If you don’t maintain the roof it won’t stay watertight, and the roof and the building beneath are going to deteriorate. The result can be water damage to the roof decking and insulation, as well as the interior walls, ceilings and electrical and mechanical systems, and a decline in indoor air quality. 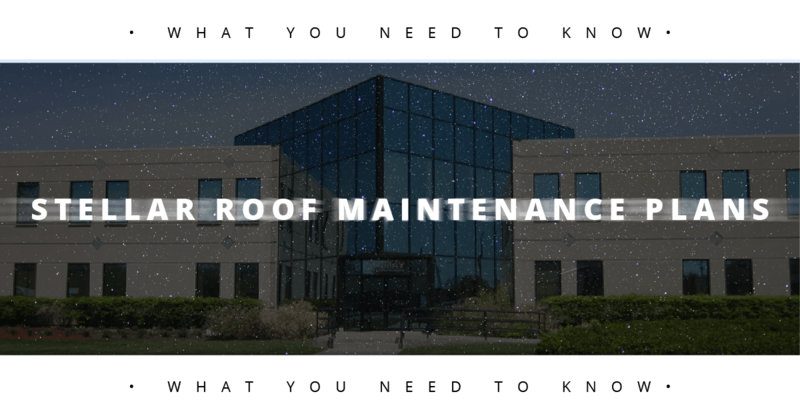 Developing a stellar roof maintenance plan can let you avoid these costly consequences and help preserve the value of your commercial property. Regular roof inspections. Detailed inspections should be performed semi-annually, and following any severe weather event. Your inspections should be done by a commercial roofer who has extensive experience with your roof type and membrane material. If the roof is still under warranty, make sure your contractor is certified by the manufacturer. Preventive maintenance. Your chosen roofer can give you advice on what maintenance is needed in between your roof inspections. This can include removing general debris and any vegetation growth from the roof, cleaning out the internal drains and scuppers to keep water flowing freely, and removing any pooling water that doesn’t drain away after a rain or when the snow melts. Addressing deficiencies. Each inspection report you receive should include a list of needed repairs along with a timeline and cost estimates for getting them completed, so make sure you follow the recommendations so the issues don’t develop further. Good record keeping. Having detailed records available makes it easier for your roofer to assess your roof’s overall condition and estimate its remaining service life. Ideally, you should have a file that starts with the original roof plan/specifications and its current warranty details, along with records for past repairs and corrective actions, changes made to the roof, and equipment installations. Going forward, add new inspection reports, maintenance checklists and repair records. For help developing a stellar roof maintenance plan for your Danbury-area commercial building, contact us at Vanguard Roofing today.